We guarantee there will never be more than 6 people per course. We want to focus on your specific challenges. We want you to get everything you can from the day. You can ask questions and get answers from an expert in a relaxed environment. You’ll leave the course with a personal plan and clear objectives. Our assertiveness training gives delegates the skills to be assertive in work situations. Delegates learn how to use different behaviours to deal assertively with colleagues, managers, suppliers and customers. They discover how to influence people and maintain a positive working relationship, even when someone challenges their opinion or disagrees with them. The course is suitable for all levels of seniority. Identifying what constitutes ‘assertiveness’ in a work environment. Revealing if your natural communication style is helping or hindering you being assertive. Discovering your instinctive assertiveness style when you’re under pressure. Knowing how and when to adapt your assertiveness style to really influence a challenging situation in the workplace. Exploring different ways to be assertive and influential in work situations. Understanding the passive and active sides of assertiveness. Using your body language and voice assertively to get people to listen to you and respect your opinion. Focusing your message and knowing what you want to achieve. Using positive language even when communicating messages people don’t want to hear. Finding a way to enthuse people by making your message positive even when they disagree with you. Feeling comfortable and having confidence when presenting your opinion assertively to seniors. Overcoming shyness when speaking in front of a group at work meetings. Turning nerves or anxiety into positive traits that actually help, rather than hinder you when you need to be assertive. Saying ‘No’ assertively when a work colleague asks you to do something that will affect your other priorities. Using work meetings as a focus for adopting assertive behaviour. Dealing with conflict assertively and sensitively. Developing a personal assertiveness action plan focused specifically on your work responsibilities. Assertiveness Training. When and Where? We run one day Assertiveness Training courses in London, Birmingham and Bristol. The cost is £329 per delegate – this includes VAT, booking fees, lunch, refreshments and access to our extensive library of post-course online resources. There’s nothing else to pay. I loved the personal approach. I have learnt a lot about myself and the right way to be assertive without appearing defensive. Finding out how others see me was an eye opener and a catalyst for change. I have gained a tremendous amount from today. Thanks for a great, memorable day. An excellent course. The trainer made me feel very at ease and was incredibly easy to talk to. At no time did he make me feel that I was wasting the group’s time. It was a very small class which made a huge difference. I took away so many new ideas and techniques to actively improve my working life. The course was excellent and the trainer was great in spotting what needs to be changed in you to be more assertive. The course gave me the opportunity to face my ‘gremlins’. I felt comfortable and confident to do this because it was such a small group. This is a very well thought out and accessible course. We had opportunities to practise and reflect on our assertiveness skills. I walked out with an action plan to implement change. Excellent! Great location and the trainer was excellent. He managed to involve everyone without forcing people to do too much or feel uncomfortable. Some very positive points to take away. I found the course to be excellent. Full of useful hints and tips. It has changed my complete way of thinking and working for the better. Small Groups, specialist trainer and FREE post course learning resources. Your trainer – Mike McClement – has been a personal development coach (specialising in confidence and assertiveness skills) for over 20 years. He’s the author of the best selling book, Brilliant Self-Confidence. Mike is deeply passionate about sharing his wealth of knowledge and experience. He has helped thousands of people move beyond their comfort zone to create real change in their lives. We guarantee there will only be 6 people on your course. A small group means a relaxed and informal atmosphere. We want you to feel comfortable and happy. With just 6 people, Mike can get to know you. Although each person’s overall reason for attending will be the same – to be more ‘assertive’, they will have their own personal reasons for coming too. Mike will have time to help you as an individual. This makes a huge difference; people tell us it is one of the main reasons this course is so successful. All participants on our face-to-face courses receive FREE access to our on-line learning resources. It’s a library jam-packed full of videos, downloads and exercises. What’s more, you can access 8 Personality Tests which give a thorough insight into how you naturally come across and behave in certain situations. Your results will act as a helpful self-improvement tool and a solid cornerstone for personal development. If you’re not sure if this course is right for you, please call us on 01364 649155 so we can explain the day in more detail. We want you to get the very most from the assertiveness course. It’s important to us that you feel happy and comfortable with your choice. Once you’ve booked your course, you’ll gain immediate free access to our on-line confidence resources. A library jam packed with engaging, specialised resources. Supplement your learning with videos, downloads and practical exercises. 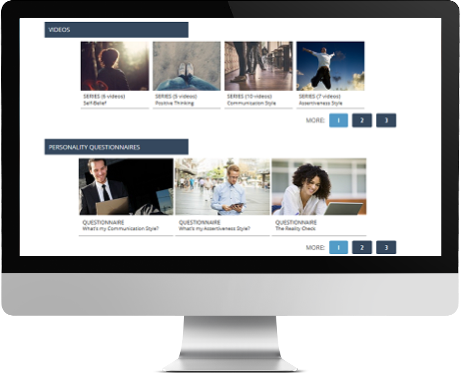 Also enjoy free access to all our Personality Questionnaires including the Reality Check Questionnaire; a unique way of finding out how other people really see you. Videos: Over 100 engaging videos packaged in bite-sized series. Personality questionnaires: Access to all 8 of our revealing personality questionnaires. Exercises: Practical exercises and downloads relating to real life. Progress tracker: See at a glance exactly what you’ve completed and what’s still left to do. Keep track of your personality questionnaire results and create a ‘favourites’ playlist. Booking an assertiveness training course is easy. Once you’ve chosen your course, date and venue you can quickly reserve a place. Click on any ‘Book Now’ button and you will be taken to the booking options page. Here you’ll have the opportunity to complete a booking form. If you are funding the course privately we ask for payment by credit card. If you’re from an organisation you can choose to receive an invoice. Alternatively, you can reserve your place by calling or emailing us. Once we receive your booking request, you will receive confirmation of your booking by email within 24 hours. You will then receive further course details about a week before the course. If you do not receive a confirmation email from us, please call us as soon as possible. If the course is showing as full, just email us on [email protected] and we’ll offer you the opportunity to go on a cancellation list. What happens on the day? Is there a course outline? The trainer will follow a schedule for the day but as the groups are small, he will allow time to focus on specific assertiveness issues that individuals want to address. We address the active side of assertiveness (speaking assertively and getting people to listen to you) and also the passive side (listening and preparing before you speak). If you have any doubts if one of our assertiveness courses is right for you, we’ll be happy to chat with you about your reasons for coming and how the day can help you. Please email us ([email protected]) or call on 01364 649155. Is there any follow up after the assertiveness course? Your training doesn’t end when you leave the course. To help you keep up the momentum, you’ll leave the course with a personal assertiveness action plan. This helps you put the assertiveness skills you’ve learnt into practice in real situations at work. You’ll also have practical assertiveness exercises to use whenever you need to be assertive at work. We also like to keep in touch after the course to find out how you’re getting on. You can contact us any time for a chat or if you’d like some advice about a specific assertiveness situation that’s comes up. What should I wear, timings, food etc..? We suggest you dress for the course in the way you feel most comfortable. The majority of people wear ‘smartish’ casual clothes. Our assertiveness courses start at 9.30am and normally finish at 4.30pm. We have three breaks during the day for refreshments and lunch. These are included in the cost of the course. If you have any special dietary requirements, just let us know beforehand so we can let the venue know. What type of people generally attend your assertiveness training courses? We meet a wide range of people on our assertiveness courses. Some book through their employer and others book the course privately. Most people attend for work-related reasons. Our delegates’ experience levels vary greatly; some struggle with being assertive within a management role, others are more junior employees who are being encouraged to be more assertive with colleagues or clients. Our small group sizes make it possible to address everyone’s assertiveness issues, regardless of their background, experience or seniority. Do I need to complete any pre-course material? You don’t need to bring anything with you or do any work before our assertiveness training courses. We’ll give you comprehensive handouts during the day which you can make notes in and take away with you. What happens if I need to cancel my place on one of your assertiveness training courses? You can cancel your place at any time. Cancellation fees may occur. For more information please refer to our terms and conditions. I have a specific assertiveness issue to deal with at work – will there be time to address my concerns? Yes. We keep the numbers small on our assertiveness training courses (maximum six people per course) so that we can get to know you properly. This makes it possible for us to address a specific assertiveness issue or difficulty you’re having at work. Places are limited. We only take 6 people per course.